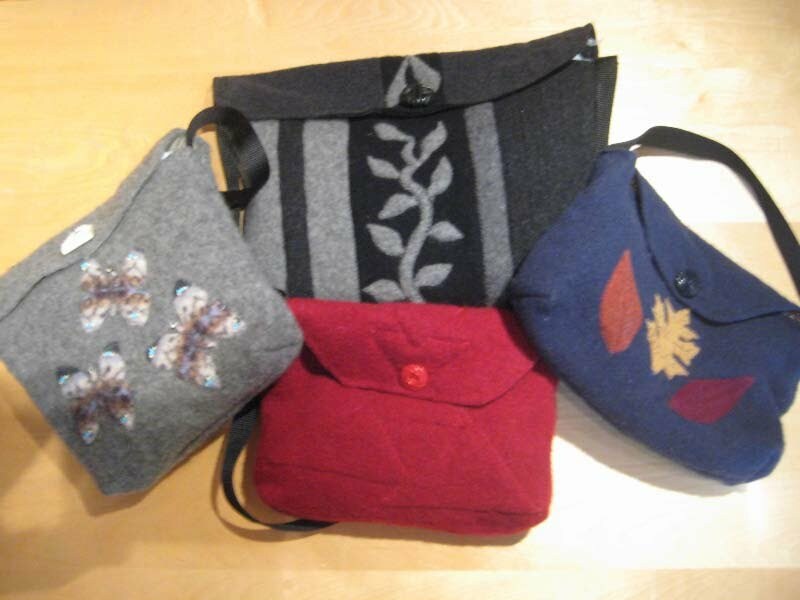 These purses are sewn from 100% wool* sweaters that have been machine-washed and dried to felt the knitted wool into a fabric that won’t unravel. 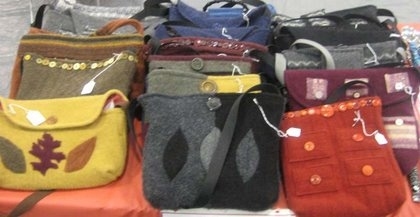 Once the sweaters are felted, I cut off the sleeves and cut out the basic purse from the body of the sweater. Since every sweater comes out a different size, I cut out the actual purse free-hand, adjusting the size and style to the sweater. I use the purse cut-out as the pattern for a lining, plus cut out pockets, etc. 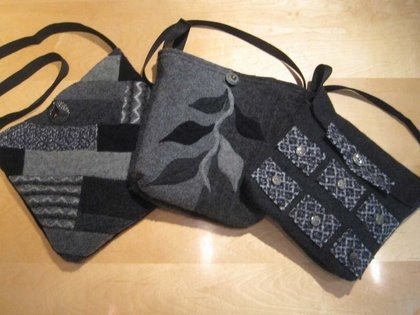 Many of the purses have additional designs sewn on them, while others are pieced together from several different sweaters (the sleeves make great panels) and sewn onto a backing fabric to add stability. The lining is sewn together separately (sew on the pocket before sewing up the side seams) and left inside-out, to be tucked into the purse. 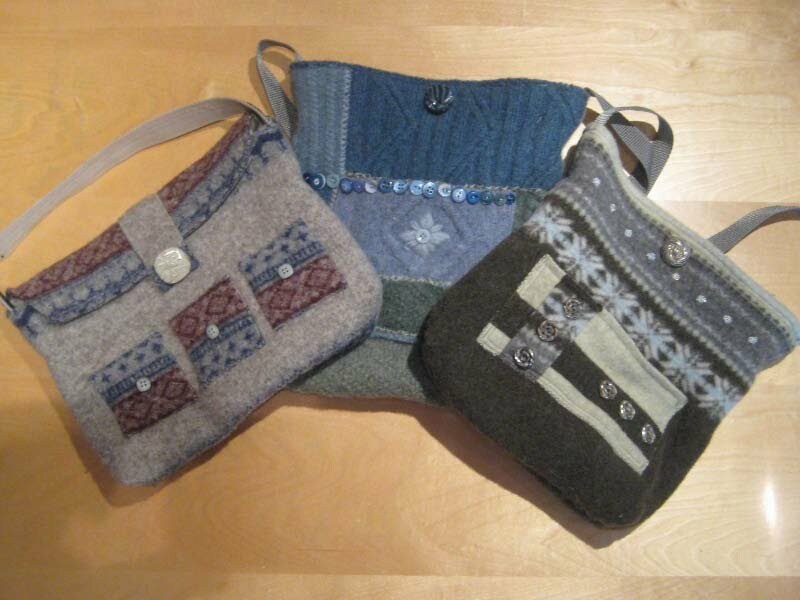 The appliquéd wool designs are sewn on before I sew together the side seams and bottom of the purse. (Exterior pockets, flaps, etc. are all sewn on before the purse is constructed, too.) Once the purse’s side seams and bottom are completed, I sew diagonal seams across the bottom corners (matching the side seam to the bottom seam to create the corner) of the purse to shape it. I use belting for the handles, and sew them onto the inside side seams of the purse, before tucking in the lining and sewing it to the top edges of the purse. While I started using large snaps for closures, I’m now using Velcro instead. Many of the designs are embellished with beading or antique buttons as a final touch. * The sweaters HAVE to be 100% wool. Even 5% nylon or polyester can prevent a sweater from felting. I wash them in hot, sudsy water, rinse them, and toss them in the dryer for 20 + minutes, then hang them to finish drying. If they don’t felt completely, I repeat the process, as only truly felted wool knits won’t unravel when cut up for the purses. Sweaters that are bulky before felting become extremely thick and heavy after washing and are much tougher to work with than lighter-weight wool sweaters. Really thin sweaters are excellent for the appliquéd designs.